We all are aware that we use watches for showing time, but what if a watch has more features than just showing time? Is it possible that a watch is capable of performing more functions? The answer is yes & it is possible with the new VibraLITE 8 Vibrating Watch. The VibraLITE 8 vibrating watch looks exactly like an ordinary digital watch but it performs extra ordinary functions. 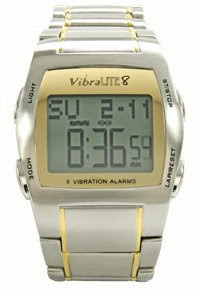 VibraLITE 8 vibrating watch comes with a large wide screen and rich metallic body. The operations of the watch are managed with 4 buttons, 2 buttons on each side. VibraLITE 8 vibrating watch comes with 8 types of alarm settings and an auto reset countdown timer which helps the users for setting up interval reminders after certain time intervals. Users can adjust the 8 types of alarm settings for the reminders, by this features the users can set different alarm for different reminder. VibraLITE 8 vibrating watch comes with a vibration feature by which the users can set their reminders or alarms with vibration of the watch, the users can also mute the alarm tone and simply keep it on vibration mode just like cell phones. VibraLITE 8 vibrating watch is an ideal for those who fail to keep track of their appointment, daily routine, meetings or any other work. In spite of having such amazing features the watch is just priced around $149.